Reaper Bones 80035: Dumpster & 80034: Weapons Locker (Part 1) (January Terrain 2019) | Azazel's Bitz Box. More terrain today – though these have been on the go for months in a neglected sprayed-silver state. I could have finished these next month for the Neglected Models challenge, but I wanted to get them done this month for Terrain Month. We’ve got a pair of Reaper Bones models in a harder plastic – one Dumpster and also two Weapons Lockers. 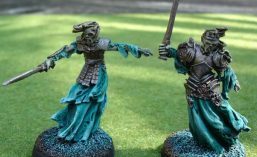 I tried a different method for the chipped paint for these – I have (had, soon!) a little bottle of Vallejo Masking Fluid, so I added bits of that to the silver (after a gloss spray again) before going over it with the dappled greens and browns. Unfortunately, as I rubbed it off, it left a horrible sticky mess and was shitful to work with, so I’ll be disposing of this bottle. I might try it again with a freshly purchased on and see how it goes. 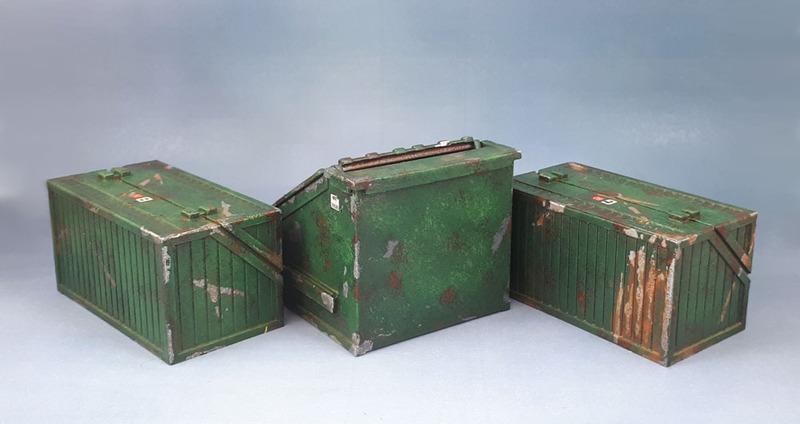 I’ve got another two “Weapons Lockers” and two more dumpsters, though I’ll be doing them in a couple of different colours, and they’re nowhere near finished yet – and as these ones are done, you can see them now! This entry was posted in DUST, Painting Challenges, Reaper Miniatures, Sci-Fi Gaming and tagged Reaper Bones, Reaper Bones 80034 Weapons Locker, Reaper Bones 80035 Dumpster. Bookmark the permalink. Nicely done mate – 12ft dumpsters for the win!! They need a ladder if you want to go dumpster diving! Ah, just remembered where I’d seen these before. The Responsible One did a few of them up a while back as well. Only dealing with pictures, and thus not having to experience the stickiness, the results of the masking fluid certainly look good. I have some Vallejo Chipping Fluid that’s worked alright for me, with no noticeable stickiness, but I haven’t used it much. Yeah, I’m not really sure I’d call that a dumpster anymore. Looks more like one of the huge containers they have down at the landfill for recyclables, that are basically a standard shipping container so they can just be loaded on a semi to go to wherever that stuff actually gets recycled. With heavy enough gloss (and matte) over the top, the stickiness is all but gone. I think it might be the Vallejo Masking Fluid had “gone off”, so I may buy a new one and try again in a little while. I’ll try their version of the crackle paint on a future bit of terrain and see how that goes (and then Jo Sonja sometime after that). Yeah, that sort of deliberate incompatibility is always obnoxious. The Dark Angels are always hunting secrets – maybe there’s a bag of shredded paperwork in there! I really like the textures and grime you’ve worked in here. You’re pretty much a natural at this stuff I think. I’ve saved it to a reference folder for when I’m trying my to paint my own large terrain pieces. I can’t imagine how much worse things are going to get, now that I have to use the words “very”, “nice” and “dumpster” all in the same sentence! I have an older “vehicle” coming up that you might like? See, now I’m just excited! Look sweet! With 32mm, the dumpster would be along the lines of a larger store sized one. The weapons lockers would be another awesome cover piece for Necromunda (or other games). Well, those Marines might be a little older, but they’re still 32mm, and even larger ones should probably not be higher than chest height! Still, wonky scale and all, they’ll look fine on the tabletop. The weapons lockers will work well with most modern+ games, I think. You succeeded with these in getting the worn look. I too tried the Vallejo masking liquid and had a similar result, plus it destroys a brush in the process. I think that I am reserving it’s use for flat surfaces as it’s too hard to remove from any details. I know a bloke who used tiny bits of blu-tac (poster tac? poster putty?) for masking on some of his vehicles and it seemed to give a pretty similar result. I might give that a go next. Can’t be more horrible to use than the masking liquid! The stuff I used was Alene’s poster tack. Infinitely reusable too. And a clean ball of the stuff gently removes any still stuck to the model without damaging the underlying paint. I’m always up to try new stuff, so I gave the mask a shot. Vallejo has a YouTube video showing the stuff in use, and for the scales we use it’s not ideal. I’m loving the versatility of the poster tack, especially as I’m doing my 15mm German tanks (trying to get my Tiger and 16 others done! ).